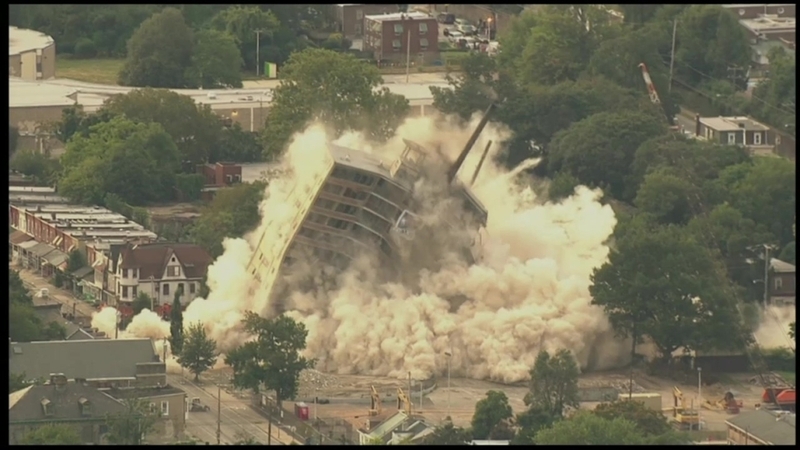 After 59 years, the Philadelphia Housing Authority's Queen Lane Apartments in Germantown became rubble Saturday morning. The plunger dropped and the dynamite was lit at 7:17 a.m. In a matter of seconds the public-housing building was gone. Earlier, residents immediately adjacent to the 16-story high rise building located at 301 Queen Lane moved their cars off of the street and left their homes to ensure their safety. The Philadelphia Office of Emergency Management launched its mobile command post to ensure the safety of residents and remained on the scene through the morning. Residents within two blocks of the demolition site were not required to evacuate but were warned of a “dust zone,” which means a dust cloud could blow over their homes depending on the direction of the wind. That cloud quickly enveloped the area. Police blocked streets around the high-rise before the implosion took place. Before the big blast, a ceremony took place at 6:15 at the intersection of West Coulter and Alfred Streets. The area was deemed safe for residents to return around noon Saturday. Last month PHA officials then bumped up the original demolition date by one day with special permission from Mayor Michael Nutter. The new housing project came about through community efforts and the signing of a Programmatic Agreement with the U.S. Dept. of Housing and Urban Development as well as several historic councils back in February. "We are relieved to conclude a long journey that began over three years ago and, as promised, affordable housing will return to this community. I know the new, modern affordable housing will enhance this neighborhood and spur other economic growth in this community," said PHA President and CEO Kelvin A. Jeremiah. "I want to thank Councilwoman Cindy Bass and Queen Lane Resident Council President Corliss Gray for their steadfast support of this project from the very beginning." In place of the apartments built in 1955 will eventually be a 55-unit development that will include a mix of low-rise flats, walkups and townhouses. According to the PHA there is a critical need for affordable rental housing in the Germantown neighborhood and therefore there will not be a homeownership option in this development. Potter’s Field, also located on the site will be identified with a historic marker. "This represents progress, but it’s also a time for us to remember and reflect upon the history of this community. PHA is investing in our neighborhood by committing to creating new opportunities for affordable housing in Germantown. I’m happy to see that after years of working together, this project is finally coming to fruition," said Councilwoman Bass. For more information call the PHA Queen Lane Hotline at 215-684-3001.